Well, it's recruiting season on campus, Freshman week. So I've been being wooed by a few different groups (man, the rugby team wanted me bad, but that's just not for me). We'll see what I end up doing. Sophia University is really an interesting school, with a wide mix of foreign, exchange, returnee and native students. Plus another Jesuit school... Which brought up a story I don't really want to tell here, so I won't. I'm finding I really, really like the place a lot. 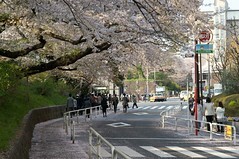 The campus is very nice as well, with a nice place for hanami along the road between campus and the practice fields/train station. Spent the night there today with the ultimate frisbee circle, I'm planning to join them, since that's always been my main sport. Been a lot busier the last few days. Anyway, too, a few pictures around there. Also, ah, some more sakura pics. Maybe someone should come take away my camera. Finally visited your pics! Lovely, as usual. In one of your past entries you mentioned Shakujiikoen--I guess when you were talking about commuting? And suddenly I could remember my older son, back when he was four, saying "Shakujiikoen" with his little-kid voice. Now his voice is all deep and grown up! Memories. So I've been being wood by a few different groups (man, the rugby team wanted me bad, but that's just not for me). Oh please oh please, could you change that word to 'wooed'? Because the image there. . . well . . .
Frisbee does not sound so much like you but well, at least you should have some awesome throwing power ^^. No, ultimate frisbee has always been my primary sport (well, since college), more than even soccer (football to you), which was my main sport in high school and before. Keep working hard! You'll do good!